Copyright: ESA/INTEGRAL/IBIS-ISGRI/F. Mattana et al. This image shows the Vela pulsar wind nebula as observed with ESA's INTEGRAL observatory at hard X-ray energies, between 18 and 40 keV, after subtraction of the point-like source corresponding to the inner nebula. The Vela pulsar wind nebula is a cloud of highly energetic electrons and positrons that are injected by the pulsar into its surroundings and radiate across the electromagnetic spectrum. The location of the Vela pulsar is marked with a cross. 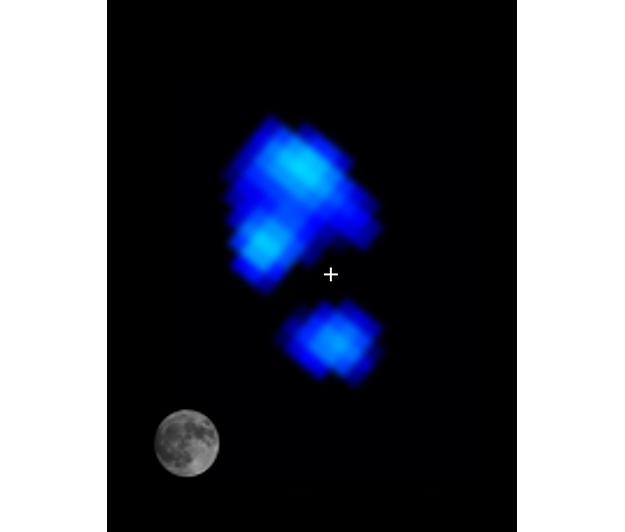 This is the first image of extended emission around the Vela pulsar at this energy range. The lower lobe corresponds to previous detections obtained at soft X-ray and gamma-ray wavelengths, whereas the upper lobe has no known counterparts at other wavelengths. Scientists believe that this newly-revealed region is a 'recently' born cloud, consisting of particles that have been injected by the pulsar in the last couple of thousand years. 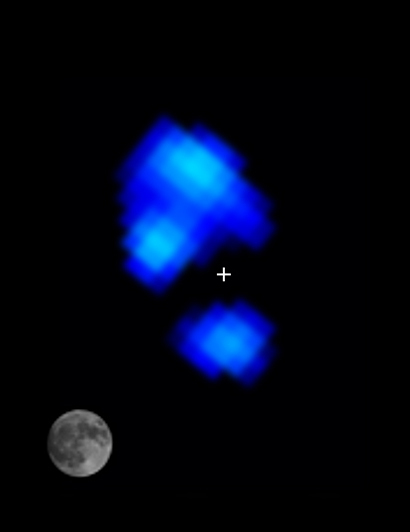 The image was obtained with data from the ISGRI low-energy detector of the IBIS imager on board INTEGRAL by exploiting a special imaging technique to correctly recover the flux of an extended source. The image measures roughly two degrees on the horizontal side. The angular size of the full Moon is shown in the lower left corner for comparison. North is up and East is to the left.